Hot on the heels of BMW's 7 Series, with remote-controlled parking,now there's a Land Rover with remote-controlled everything. Currently at the concept stage, it's a bit of purest James Bond engineering magic. Land Rover's system lets you control this specially adapted Range Rover (not available in shops) completely via smartphone, from outside the vehicle. The smartphone app includes control of steering, accelerator and brakes as well as changing between high and low range. This allows the driver to walk alongside the car, manoeuvring it out of challenging situations such as the one below safely, and probably more than a little smugly. 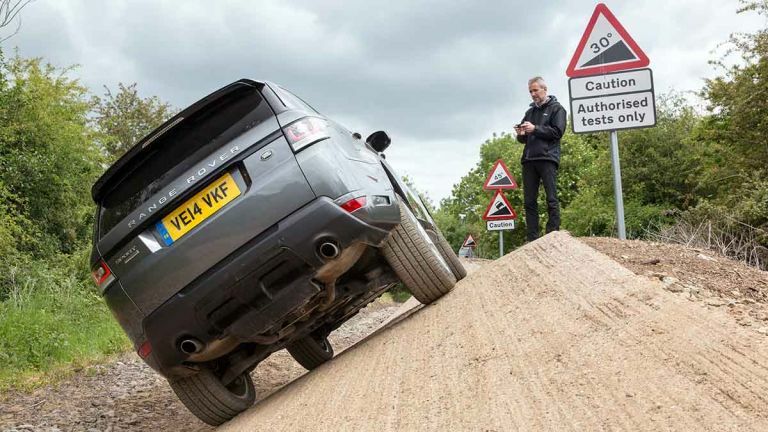 The "multi-point turn" Range Rover is capable of manoeuvring 180 degrees via smartphone prods, to get you out of sticky situations such as dead ends or ridiculously steep inclines. The system uses sensors to assess available space and to avoid pedestrians, vehicles and other objects. The software on the app handles gear selection, steering, braking and acceleration, letting you make as many forward and backwards movements as necessary to achieve whatever insane manoeuvre you're trying to pull off. Our man Spencer Hart's just spent the day with Land Rover trying out this and all the brand's other future innovations - we'll have a full report tomorrow.